The Purple Passion Asparagus, Asparagus officinalis ‘Purple Passion’, has tender spears that are a beautiful deep burgundy color and measure up to 3/4 inches in diameter. This asparagus is more tender, mild and sweet than standard varieties with 20% higher sugar content and is often eaten raw. It is vigorous and productive, producing spears a year earlier than most varieties. It can be grown all over the U.S. It provides excellent purple color if added to salads raw, but turns green when cooked. When cooked, the sweetness gives this asparagus a mild, nutty flavor. Purple Passion has some resistance to rust, root/crown rot and fusarium. Asparagus is the earliest vegetable harvested fresh from the garden each spring. It is known for its flavor and nutrition. It’s an excellent source of vitamin A, and contains significant amounts of vitamin C, riboflavin, phosphorus and calcium. One cup of cooked fresh asparagus contains only 30 calories! Asparagus is a perennial plant that comes back from the same root system each year. A productive bed of asparagus can last 15 years or longer. It needs well-drained, deep soil and plenty of sunlight; at least 8 hours daily. For best results the soil pH should be between 6.5 and 7.0. Expect years of reliable performance! 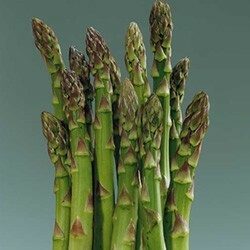 The Mary Washington Asparagus, Asparagus ‘Mary Washington’, is a strong grower with large spears produced in spring. 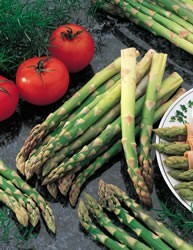 This asparagus is a favorite of gardeners that are looking for excellent taste. It is good for cooking and canning. Mary Washington is reliable and resistance to rust. The delicious asparagus shoots (called spears) are tender, thick, heavy and straight and are of a rich dark green color with a purple tinge. They are uniform in size, about 10 inches in length. They have a delicate, delicious flavor when cooked. 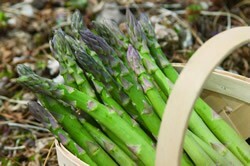 Asparagus is the earliest vegetable harvested fresh from the garden each spring. It is known for its flavor and nutrition. It’s an excellent source of vitamin A, and contains significant amounts of vitamin C, riboflavin, phosphorus and calcium. One cup of cooked fresh asparagus contains only 30 calories! Asparagus is a perennial plant that comes back from the same root system each year. A productive bed of asparagus can last 15 years or longer. It needs well-drained, deep soil and plenty of sunlight; at least 8 hours daily. For best results the soil pH should be between 6.5 and 7.0. Expect years of reliable performance!